50-year-old man dies while immersing himself in the sea before his grandson's Brit Milah. A 50-year-old Jewish man drowned at a Netanya beach Monday. 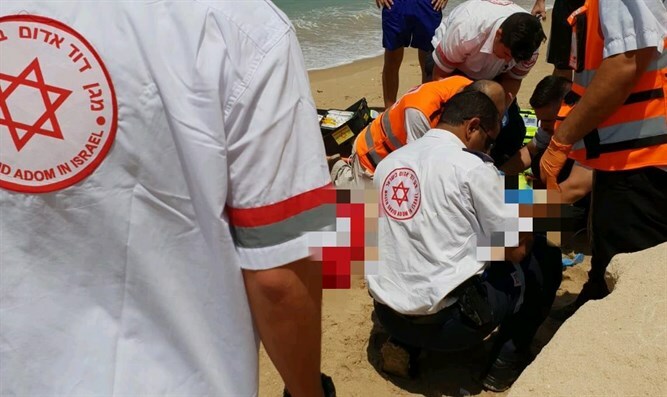 The Kikar Hashabbat news site reported that the man was a religious Jew who sought to ritually immerse himself in the sea prior to the Brit Millah of his newborn grandson, which was to take place today. Magen David Adom paramedic Ron Levi said: "When we reached the shore, we saw a man of about 50 lying unconscious north of the declared beach. The rescuer who saw him from a distance dragged him out of the water. He was unconscious, not breathing, and had no pulse." "We carried out long-term resuscitation activities that included medicine, respiration and massages, but unfortunately after a long time we have had no choice but to determine his death."